The room at the top of the narrow staircase. Our second-floor room was reached by a very narrow staircase. 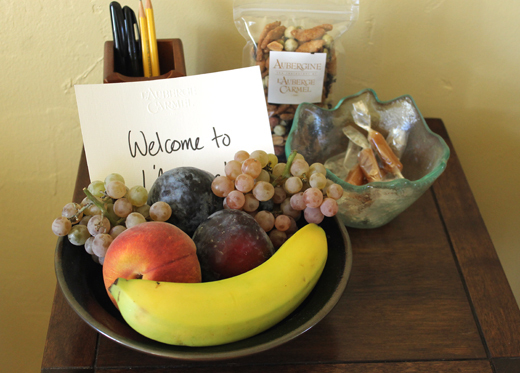 Inside, there was a welcome treat of fresh fruit and a bag of Japanese crackers, wasabi peas and dried seaweed. 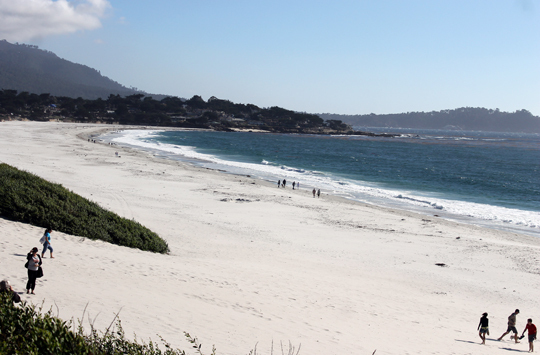 The inn is just steps away from the village’s many antique shops and cafes, and only four blocks from Carmel Beach. Aubergine is just off the courtyard. As you enter the intimate dining room (just 30 seats) with its ceiling of crisscrossed dark beams and its wall of arched windows, you’ll pass the restaurant’s cheese cave, a new addition that holds not only the offerings for the cheese course but a few choice bourbons, too. Normally, you can choose from either a four-course tasting menu ($98 per person; $75 for wine pairings) or the chef’s tasting menu ($125 per person; $110 for sommelier wine pairing; $175 for premium wine pairing), but once a month the restaurant features a Terroir menu. It’s one four-course menu for the night that features a different theme each month. Priced at $85 per person — and that includes wine pairings, mind you — it’s geared toward bringing in more locals to dine midweek. 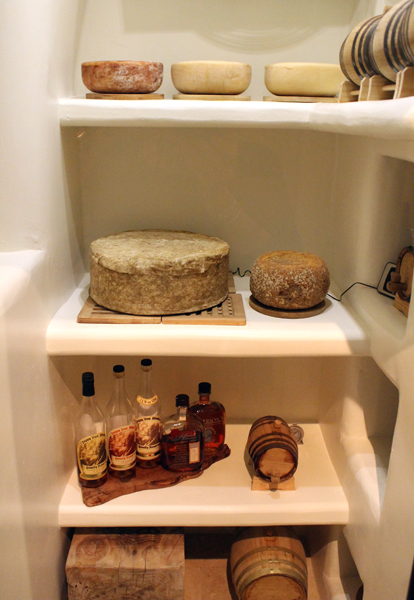 The cheese cave at the entrance to the restaurant. 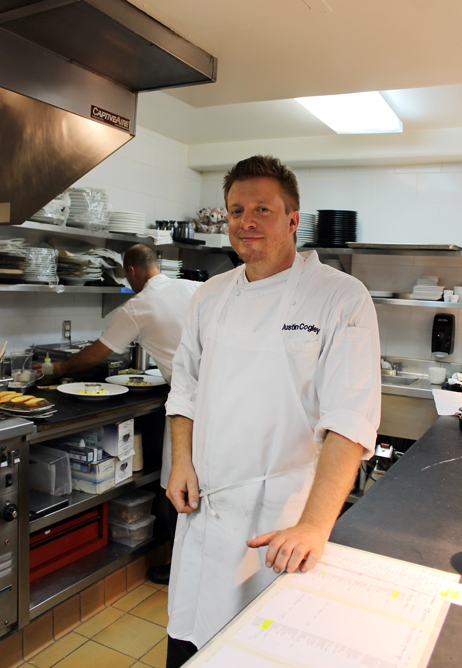 Cogley has been offering the Terroir dinners for the past two years. He comes up with the calendar for them in one shot, and finalizes the dishes only days before each one is held. They’re so popular now that he even has guests who book the Terroir dinner for all 12 months. The night I was there, the theme was “French Bistro.” And it was probably the most refined version of bistro food I’ve encountered. 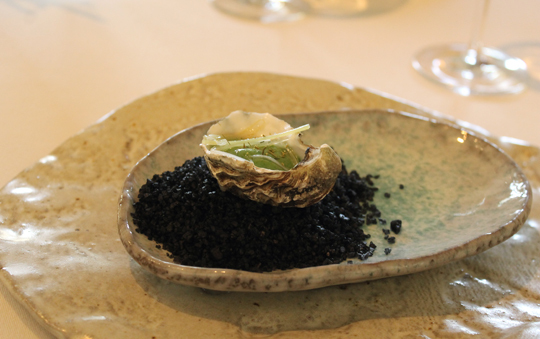 The amuse was a Kumamoto oyster on the half shell accented by dill and frothy potato foam. The prettiest rendition of salmon tartare around. The first course was “Tartare de Saumon” paired with a 2009 Dom. J.A. Ferret Pouilly-Fuisse from Burgundy. The finely chopped salmon was arrayed in a ring with a puddle of creme fraiche in the center. Around the perimeter lay finely chopped hard-cooked egg, micro herbs and a few bright orange salmon eggs here and there. Dig your fork in to get a little of everything in one bite like a chopped salad. Just the knife-skills alone were impressive in this dish. But so was the balance. 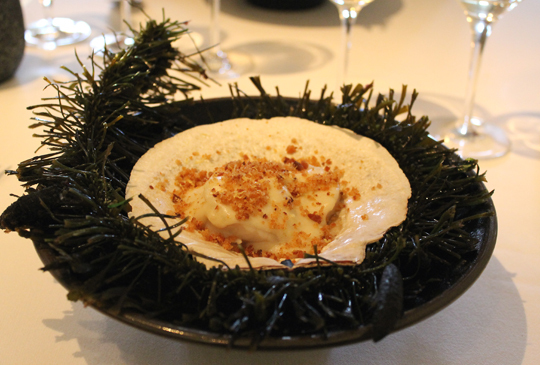 Next, the classic Coquilles St. Jacques served with 2010 Francois Chidaine “Les Tuffeaux” Montlouis Sur Loire from the Loire Valley. 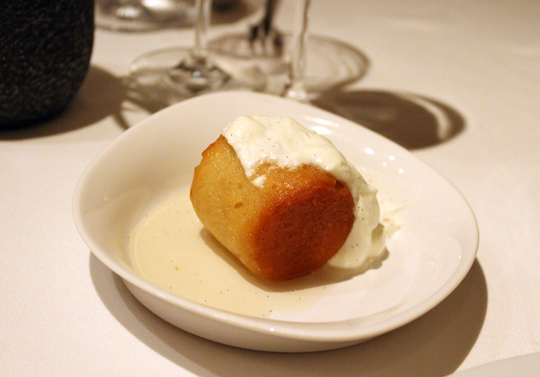 The large, tender diver scallop was enveloped in a thick, rich, cream sauce infused with lemon peel. It sat in its own shell that was wrapped dramatically in black seaweed. A striking remake of a classic. 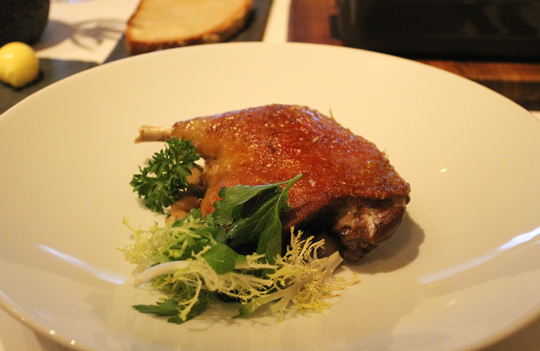 The entree was duck confit, with the leg cured for one day. The mahogany skin was wonderfully crisp with none of that lingering fat underneath and the flesh was as moist as can be. Cranberry beans and a fruity-sharp Calvados mustard sauce rounded it all out. A 2012 Chateau de Pibarmon Bandol Rose from Provence was a perfect sip with its bright berry flavors and effervescence to cut through the duck’s richness. Duck confit with cranberry beans. Although the “Terroir” menus are a set four courses, they often feature a couple of extra options if you want to indulge your palate and wallet more. 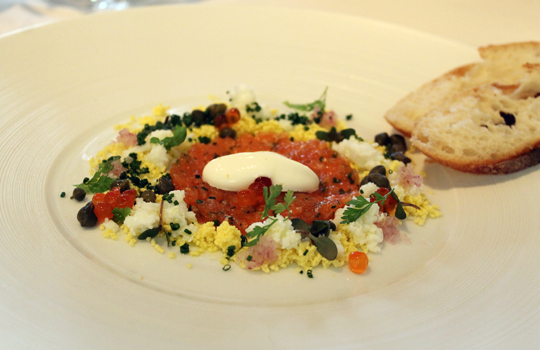 For instance, you could add an ounce of sturgeon caviar to the salmon tartare for an additional $96. 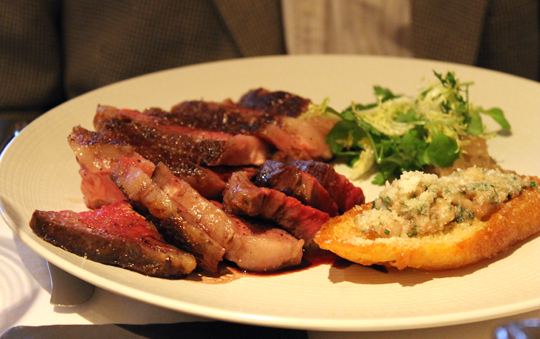 Or instead of the duck confit, you could opt for the dry-aged cote de boeuf. It’s 10 ounces of 28-day aged rib eye. It costs an additional $79. 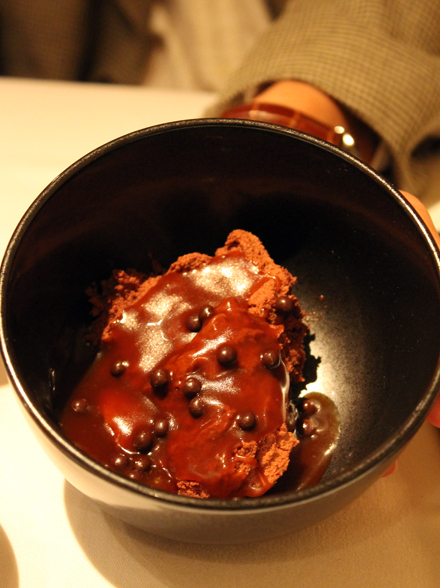 And it’s presented in all its glory in a copper pan at the table before being carted back to the kitchen to be plated. It’s a sight to behold as my husband saw. Honestly, how could Meat Boy resist, right? 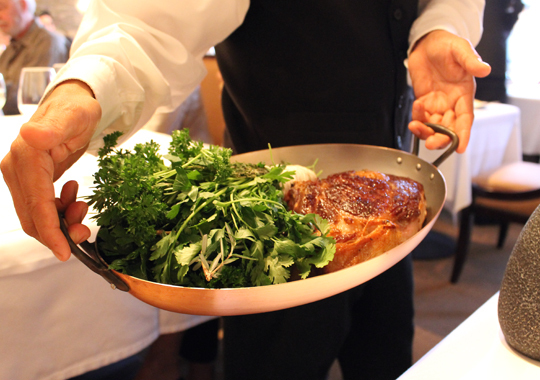 The magnificent cote de boeuf presented tableside. And served on the plate. It’s definitely a luxurious piece of meat — brimming with juice, a nice cap of fat and a glorious sear on the outside. Red wine sauce is spooned over it. If that weren’t enough, on the side is a crostini smeared with unctuous bone marrow. It’s a meat lover’s dream come true, especially with a glass of 2011 Alain Graillot Crozes-Hermitage from the Rhone alongside. 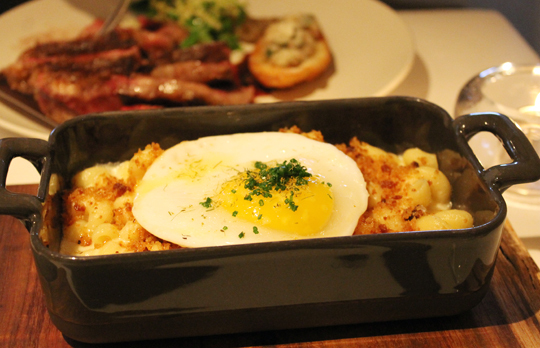 You also can add a side dish of macaroni gratin enfolded in mornay sauce and with a sunny-side-up duck egg on top ($18). 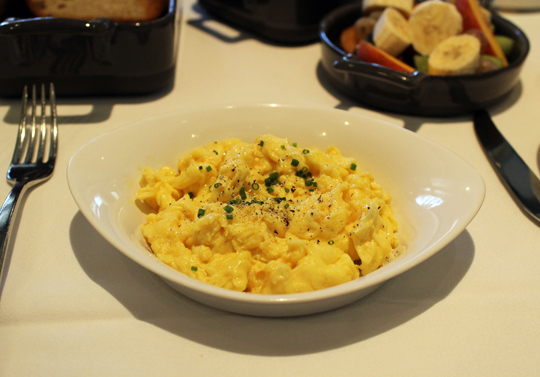 It’s as rich as you imagine, and the yolk gets mixed into it all to make the dish even more decadent. 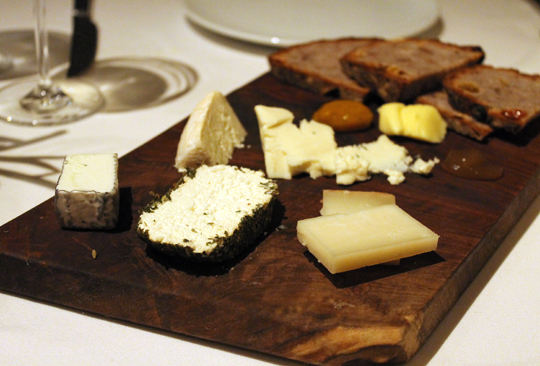 If you still have room after all that, a cheese course is offered as an extra ($20). If there are two of you, one will easily suffice, as you’ll get an array of blue cheese and goat cheeses, including the delightful Acapella from Adante Dairy. A selection from the cave. 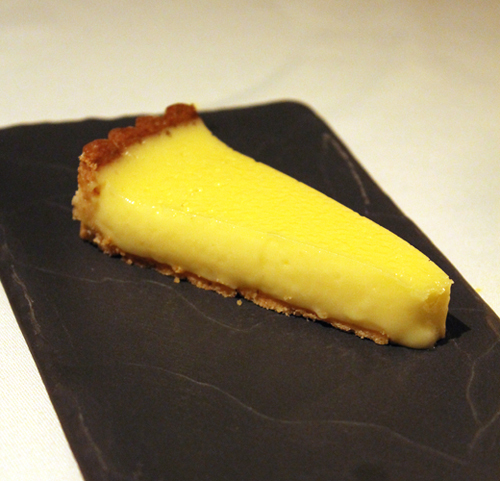 Dessert is also meant to be shared. 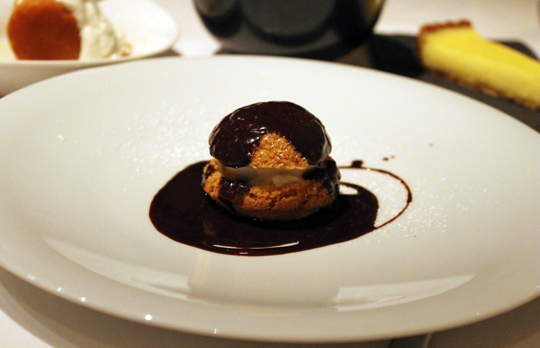 That night it was a parade of plates holding a profiterole sandwiching vanilla ice cream; a light, bright lemon tart with just enough sharpness; an airy baba au rhum with a cloud of cream on top; and a bowl of chocolate mousse crowned with chocolate pearls and caramel. 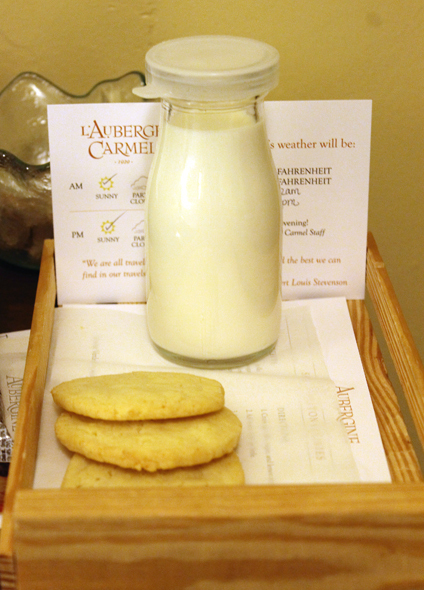 As you stagger happily back to the room, there’s still more: You find a cold bottle of milk left for you, along with buttery, lemon sables — including the recipe for them. To ensure a good night’s sleep. Breakfast is also included in your stay. 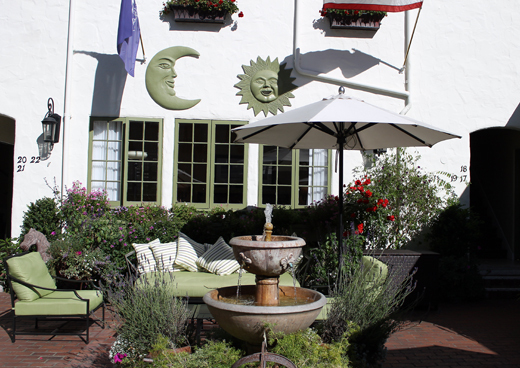 You can enjoy it back in that same dining room or in the courtyard. 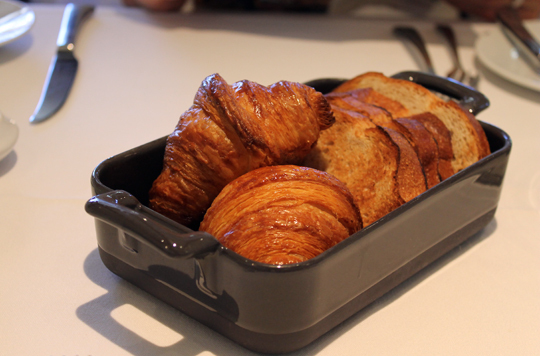 There’s coffee, fresh-pressed juice, a fruit salad, eggs any way you like, and warm, flaky croissants. 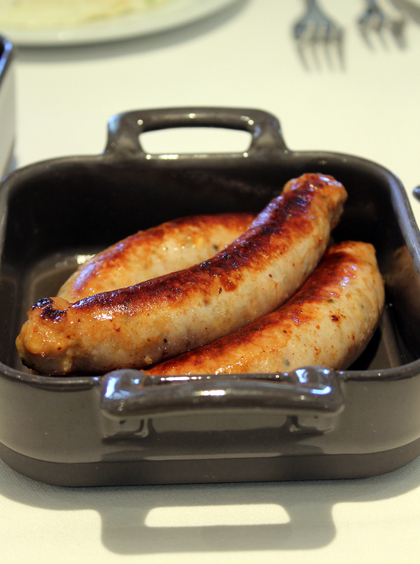 You can supplement your morning meal with other items for an added cost, such as the plump chicken sausages we had. Classy scrambled eggs and an assortment of fresh fruit. 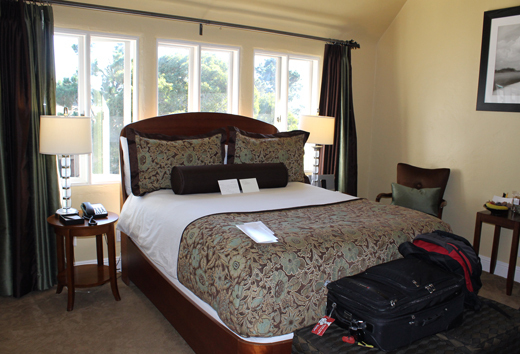 There are many types of wonderful stay-cations to enjoy in Northern California. 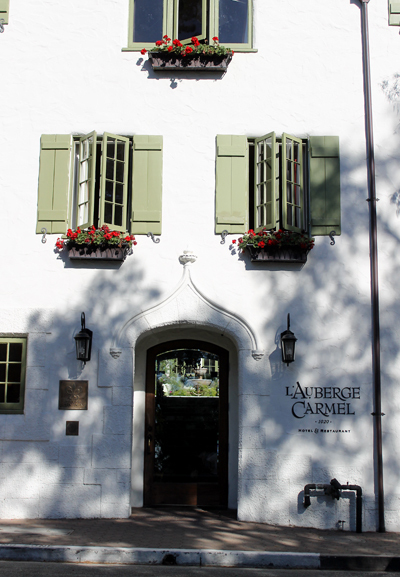 L’Auberge Carmel definitely serves up a most civilized one.